The PetSafe Sportsmen Latex Meeze Dog Toy is sure to keep your pup occupied for continuous playtime fun. Made of soft latex, these toys make a loud squeak sound when squeezed and the creature’s features extend and wave as the toy inflates back up. 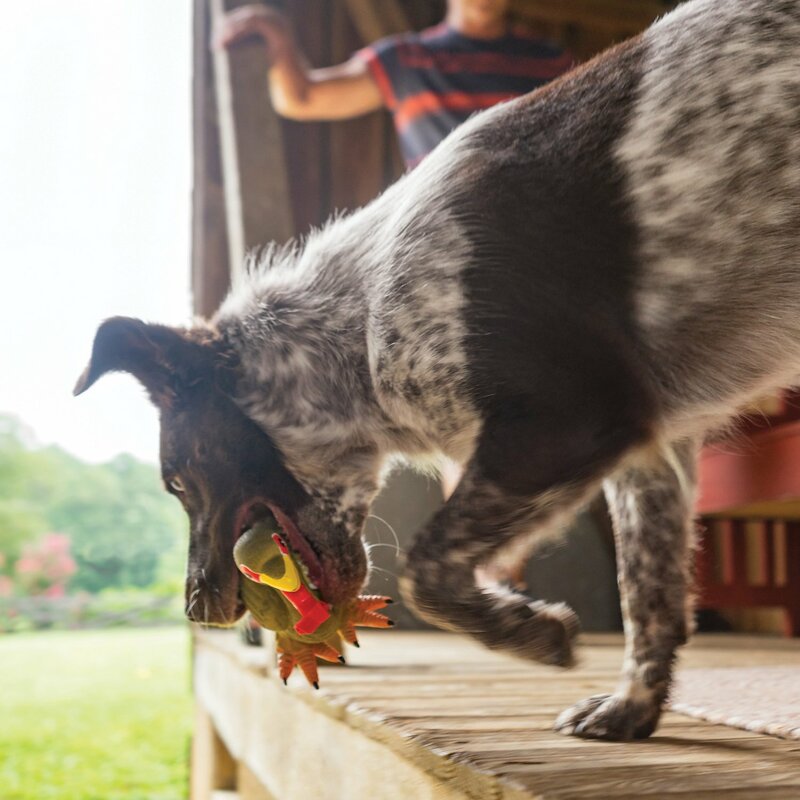 The different extending features give your dog lots of places to grab when playing a game of fetch, or just chewing their boredom away. Collect all designs for your outdoors-loving pup to enjoy. Keep your dog occupied for hours with these vibrantly colored outdoor-themed toys. Made from soft latex, these toys withstand even the toughest of chewers. Loud squeaker appeals to your dog’s natural instincts to hunt. The creature’s features extend and wave as the toy inflates, keeping your dog interested. Great for a game of fetch or just chewing the boredom away. lasted less than 15 minutes! My cocker shreads every toy within 2 hrs. He chewed the waddle off this turkey but loves it and so far unable to chew any other parts off! I have an 11 month old border collie that loves to chew. Latex toys last the longest. 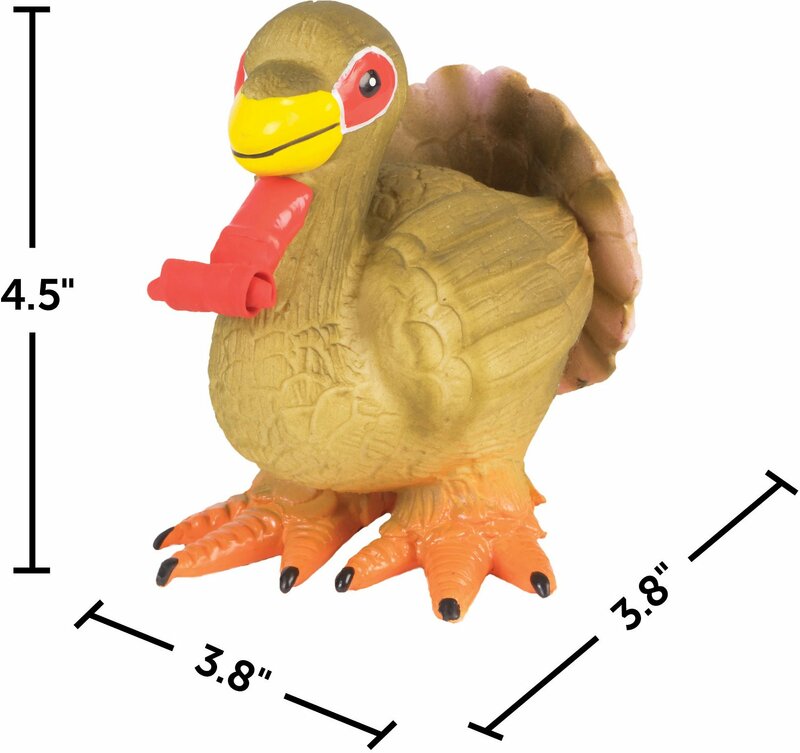 This turkey is adorable and durable! 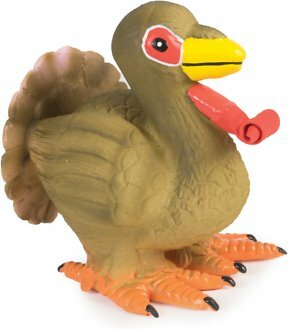 I knew it would only be a matter of time til the red gobbler part was chewed off, so I suggest cutting it off and getting it over with so it's not swallowed. But we love this toy! My son’s golden retriever loves the turkey I got her for thanksgiving! Bella loves her turkey. We play throw, she plays with it . Best toy I purchased other than one other toy! My Afghan/Golden mix works very hard at destroying all toys. This one looked delicate,coming out of the box,and I was reluctant to give it to her at first. I finally released it; and, after several months, she has succeeded in removing exactly one "toenail"! This toy is far sturdier than it looks...and she loves it! Got this based off the reviews that it held up alright but my beagle started tearing it's nails and feet off within minutes. Not worth it at all. I have to the number 1 chewer in the world, he destroys toy in a matter of hours, I bought this toy along with the chipmunk and both toys have lasted 2 weeks now and the squeaker still works. Grand dog absolutely loved it. So funny to watch him play with this squeaky turkey. But the fun lasted less than 24 hours.